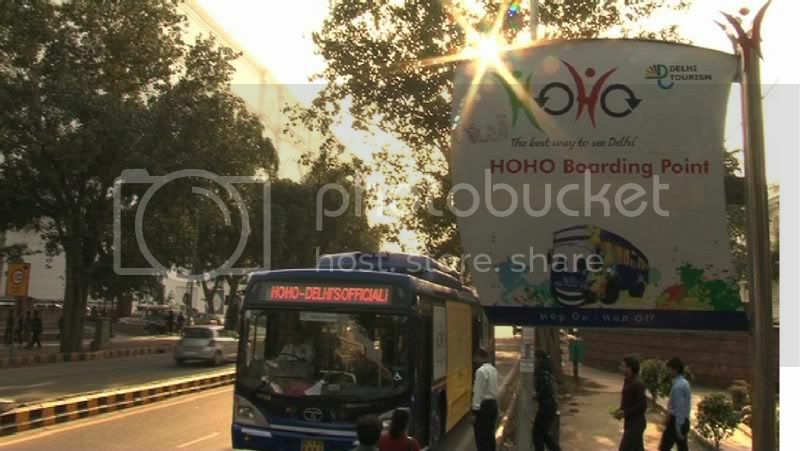 Hi..I get to hear one question a lot, " from where can I board the HOHO Bus for Delhi Darshan (Sightseeing) ?" .." From Delhi Airport how to reach HOHO Bus boarding point"..."I stay in Gurgaon, what is the nearest HOHO Bus stop." 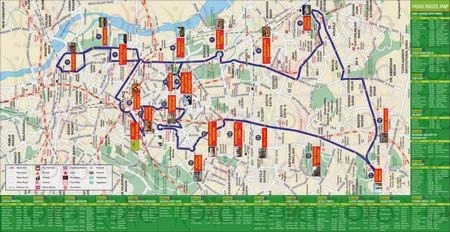 In this post I will explain how easy it is to board HOHO bus,no matter you are a localite staying in Delhi for a decade or a traveler coming all the way from America for the first time to explore Delhi. 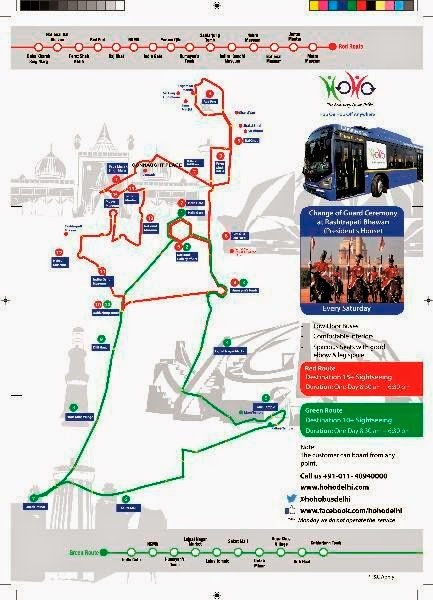 HOHO Bus has now two Routes - Red & Green . CLICK to get More Information on Places Covered in Each Route. however it does not make difference to the places covered. Secondly, Buses are available every 45 mins/30 mins (depending on season) from all the boarding points. Thirdly, locating HOHO Bus stop is very easy as you can find these locators at each of the 19 HOHO bus stops as shown in the image below. These are very easy to locate, our customer care are available from 8 am to 9 pm to assist you. Keep helpline number 011-40940000 handy with you all the time. 3. HOHO Office at stone throw distance. Most of the Hotels are in Central Delhi, and travelers prefer staying in Connaught Place, Karol bagh, Pahar ganj. There are also many hotels in South Delhi like Kailash Colony, Lajpatnagar. 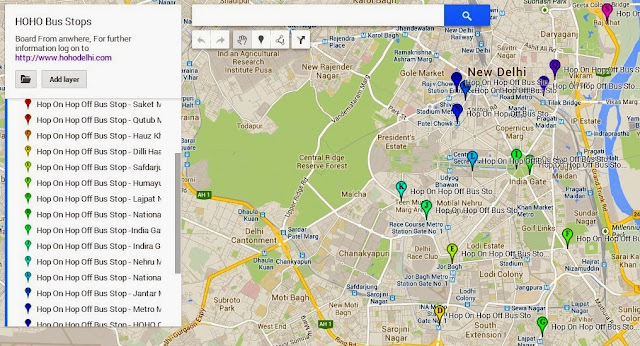 HOHO bus stops are available in Central as well as south Delhi, and because of good metro connectivity these are easily accessible, no matter where they are statying. Take a metro to Qutab Minar Metro Station , board HOHO bus from Qutab Minar Complex , first bus comes at 10:15 am & 11:00 am & then every 45 mins. or better, take a direct metro to Rajiv Chowk metro station as mentioned earlier. 1.A metro from Badarpur Metro Station to Kalkaji Madir Metro Station is the most convenient way to Board HOHO Bus at Lotus Temple point, as shown below. First bus comes at 10:20 am. it seems very interesting and exciting. I am very impressed with the blog and information available here. Great details about the hoho buses. When are they extending their services? Thanks Pradeep. Try HOHO bus sometimes. It will be a Memorable experience. Past time some renovation for this mall. So many of the Genie Boom Lift work with highly did his work fastly great. You are also welcome..
Good Blog with good Pictures, i really like it.We provides Tempo Traveller in Delhi ,Tempo Traveller in Gurgaon , Tempo Traveller on rent in Noida , Tempo Traveller on rent in Ghaziabad , Tempo Traveller on rent in Faridabad , Tempo Traveller,Tempo Traveller rental faridabad,Tempo Traveller rental gurgaon,Tempo Traveller rental Ghaziabad,Tempo Traveller hire faridabad,Tempo Traveller hire noida ,Tempo Traveller hire Ghaziabad for easy travel. I am very thankful for the sharing this useful post.